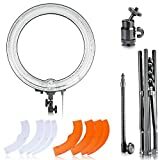 It’s a 18″ ring fluorescent flash light and with reinforced flexible arm which will move freely and never droop.Extra long cord and heavy duty thumb screws makes it perfect for photography enthusiasts. This 59″/150cm light stand is constructed from aluminum alloy,giving it exceptional strength for heavy duty work.For simple storage and transport,the stand collapses easily and is very lightweight to carry. White&Orange Color Filter Set:Made of high light transmission plastic materials,which is light weight,steady color temperature and low loss. The soft tube cam make the light rotate freely for the best position.The kit also include a hot shoe adpater for most DSLR camera.Note: camera are NOT included. Note: This item comes with a UK mains adapter permanently fixed to the power cord. The mains adapter is fused and complies with BS 1363 regulations. This entry was posted in Discount Photography and tagged 5500K, 600W, Camera, Diameter, Dimmable, equivalent, Fashion, Flash, Fluorescent, Light, Lighting, Neewer, Photo, Photography, Portrait, Ring, SelfPortrait, Shooting, Studio, Video, Vine, Youtube by Ball Photo. Bookmark the permalink.